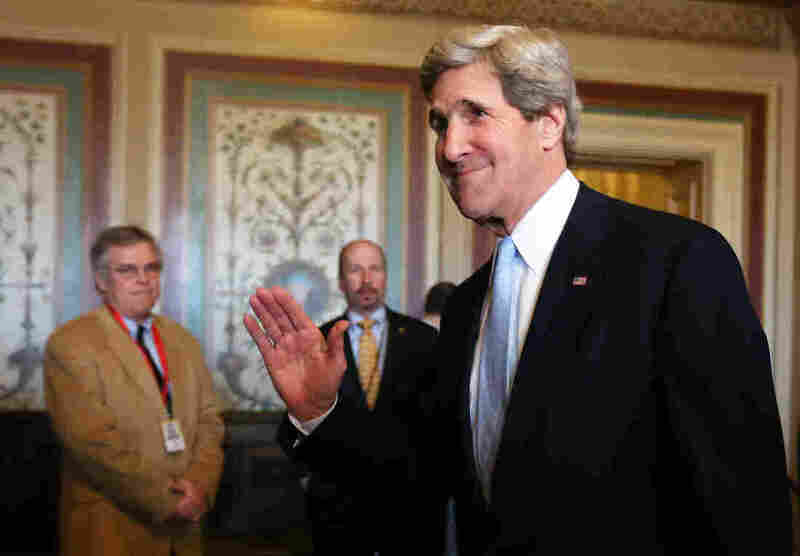 Senate Confirms John Kerry As Next Secretary Of State : The Two-Way The Massachusetts Democrat will succeed Hillary Clinton. His departure from the Senate is likely to spark a fierce battle for his vacant seat. Sen. John Kerry (D-MA) has been confirmed by the senate to become the next secretary of state. "As the ranking Republican, Bob Corker of Tennessee, was quick to point out, Kerry seems to have been grooming himself to become secretary of state all his life," Michele reported. Perhaps unsurprisingly, then, the vote was in favor of Kerry 94 to 3. The Boston Globe reported Monday that Gov. Deval ­Patrick was set to announce an interim senator on Wednesday and that he had settled on a special election to take place June 25 after an April 30 primary. That is expected to be a tough-fought election. Kerry will succeed Hillary Clinton. Sen. Jim Inhofe, a Republican of Oklahoma, as well as Texas Sens. John Cornyn and Ted Cruz voted against the nomination. Kerry voted present.